The Eclipse by Tough1 Pro Nylon Trail Saddle features leather and dot embellishments with silver star conchos. 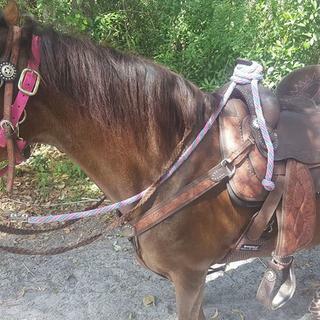 In addition to being a great lightweight saddle for use on the trail, it comes in a package that includes a matching nylon headstall, reins, and breastcollar with leather overlay, canvas saddle pad with fleece bottom, cord girth and shaped leather spur straps with dot embellishments. All in fun prints! I love that it comes with all the matching items. The saddle is very lightweight, which is a huge plus. The design is really nice. I got the brown tooled look saddle. I really like it, and I've gotten many compliments on how nice it looks and especially on my horse! It matches her colors. The only thing I don't really like about it is the conchos look very cheap quality when you look at them up close. The reins are super long, so I ended up switching to a different pair, just my preference. I had to get an anti-slip pad to put under the one it comes with. Nice little starter set for my grandaughter. Now that she has shown her passion for horse riding, this will brighten her ride! I'll be back shopping here for her next upgrade. My wifes Christmas present. She picked it out. fit a 14.2HH mare QH? BEST ANSWER: I have a Standardbred gelding and the set up works well. I had to use a different girth as the one provided in the set is a 33 inch and my guy needs a 24 inch. I will need to make adjustments to the breastcollar as he is narrow in his build. He is 14.3 hands and overall this fits him well. I had to adjust the sizes of the bridle, breast collar and girth for mine, but she's pony-sized so these should fit yours better. And if not, they are super easy to adjust yourself! These package components are full size. If your horse normally uses full or regular horse size tack, this package should work. Does this saddle come with a flank cinch? The flank cinch is not included. What size is the girth? How do we order different sizes? This package comes with an average size girth. Size cannot be specified. Can the leather parts on the saddle get wet? BEST ANSWER: The leather on the saddle will react just like any leather would when it gets wet. We would not recommend complete submersion in water. The leather on this saddle will react the same way any leather does when wet. Will the stirrups get short enough for someone that is 4'10"? Thank you. I'm having a hard time finding a saddle to fit me. Do you know of any? You would need to modify them. It wouldn't be difficult to do. I am 5'7" and I will be shortening them more. Are they semi or full bars? I would consider them semi. My daughter purchased this saddle in a 14" seat, but had to sell it because it was to narrow for her quarter horse cross. Are the reins connected or are they separate? BEST ANSWER: The reins are separate splits. You can punch holes and tie them with cording if you want them together. What is the seat covered in? Is the tree okay? Plastic or fiberglass? BEST ANSWER: This saddle tree is rawhide wrapped in fiberglass with wood reinforced at the contacts. Do the Stirrups have Belvins? Does it work well with high wither horses? BEST ANSWER: This saddle is built on a full quarter tree and has a 7" gullet. It is always best to consult a local person with experience fitting saddles if you are unsure what saddle /padding you should be using on your horse. Does this saddle have Full QH Bars? what size is the skirt on this saddle? BEST ANSWER: Skirt: 21.5" x 24"